Increasing demands for compliance with safety systems and overfill protection have mandated more reliable point level measurement. Echotel® Models 961 and 962 ultrasonic level switches meet these demands with advanced transducer designs, extensive hazardous location approvals, and a new self-test technology. ECHOTEL Model 961 offers the ultimate solution to reliable single point liquid level measurement. This advanced switch uses pulsed signal technology for superior performance in difficult process conditions, and to provide excellent immunity from sources of electrical noise interference. Extensive self-testing of the electronics and transducer make this advanced switch suitable for use in Safety Integrity Level (SIL) 2 loops. The ECHOTEL Model 961 is equipped with advanced diagnostics that continuously check the sensor and electronics. The diagnostics also alarm for electrical noise interference from external sources. ECHOTEL Model 962 is a dual point switch that can be used as a level controller, or to control pumps in an auto fill or auto empty mode. The tip sensitive lower gap performs well in aerated or foamy liquids, and can measure to within 1.4″ of the vessel bottom. The rigidity of the unique flow-through upper gap allows separations of up to 125″ (318 cm) between the upper and lower transducer gaps. Application: High Level Alarm Automated gauges for Tank Level measurement as an alternative to traditional methods of tank gauging for API 18.2 standards. Model 961/962 switches utilize ultrasonic energy to detect the presence or absence of liquid in a single or dual point transducer. Ultrasonic contact level technology uses high-frequency sound waves that are easily transmitted across a transducer gap in the presence of a liquid media, but are attenuated when the gap is dry. 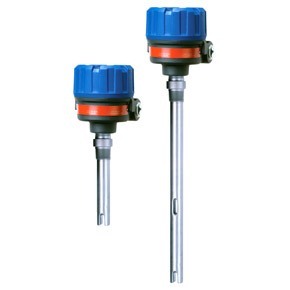 Model 961/962 switches use an ultrasonic frequency of 2 MHz to perform this liquid level measurement in a wide variety of process media and application conditions. The transducer uses a pair of piezoelectric crystals that are encapsulated in epoxy at the tip of the transducer. The crystals are made of a ceramic material that vibrates at a given frequency when subjected to an applied voltage. The transmit crystal converts the applied voltage from the electronics into an ultrasonic signal. When liquid is present in the gap, the receive crystal senses the ultrasonic signal from the transmit crystal and converts it back to an electrical signal. This signal is sent to the electronics to indicate the presence of liquid in the transducer gap. When there is no liquid present, the ultrasonic signal is attenuated and is not detected by the receive crystal.